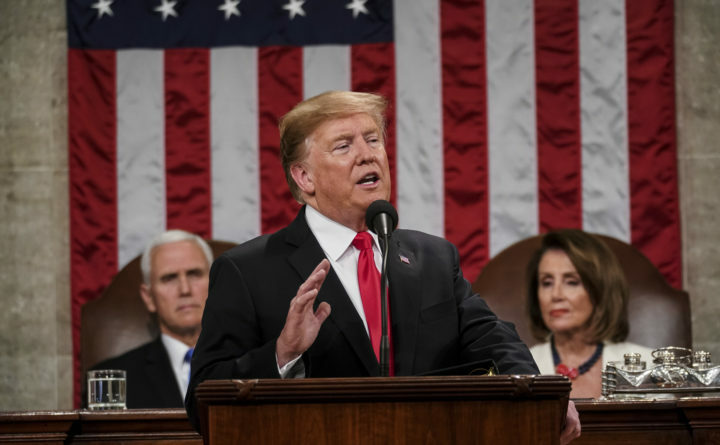 In this Feb. 5, 2019, photo, President Donald Trump gives his State of the Union address to a joint session of Congress at the Capitol in Washington, as Vice President Mike Pence, left, and House Speaker Nancy Pelosi listen. President Donald Trump operates in the moment, where every encounter necessitates that he be perceived as the winner. Insofar as his words have no relation to action and his aversion to facts is so strong, he will say practically anything to get himself out of a jam. Hence, we saw him claim ownership of the shutdown because in that moment, facing adversaries and performing in front of the cameras, he thought that might help him look like a tough guy. Moreover, how is Trump’s scenario supposed to work? Congress passes a bipartisan infrastructure bill and, what, Trump won’t sign it while the House investigates potentially unconstitutional emoluments? Congress passes a wholly popular drug-cost-reduction bill and Trump vetoes it because Congress is investigating his inhumane family-separations policy? On Wednesday, House Speaker Nancy Pelosi, D-California, admonished him for making a threat in the House. Once more, she got the better of him. In many ways, that is the story of his presidency. A man entirely ignorant about policy and governance playacts his way through his presidency, using language that dense people think is smart and ignorant people imagine sounds erudite. The problem for Trump remains: reality. Today and tomorrow and for many days afterward, special counsel Robert Mueller and House investigators will call witnesses, gather evidence and probe wrongdoing. If the facts and the law are on their side, Trump and his cronies will be powerless to stop them and will by one means or another be held accountable. All the hollers of “Witch hunt!” didn’t save Paul Manafort from conviction on eight counts or spare Michael Cohen from a jail sentence. Trump and a cynical media might think that “nothing matters” and that Trump’s words are without consequence. His right-wing media bubble that fills his brain during hours of “executive time” will tell him comforting lies and reassure him that he is “winning.” However, the midterms, sinking approval ratings, more than 30 indictments and the inevitable progress of the Mueller investigation should remove all doubt that reality matters. It’s Trump’s words that don’t.